Our highly concentrated investment approach is driven by a research-intensive, disciplined and selective process that allows us to construct an idiosyncratic portfolio, with a goal of generating high absolute returns for our investors. AREX Capital is a New York based hedge fund that launched in October 2017. We are a bottom-up, value-oriented, equities-focused investment manager. We engage in rigorous fundamental research and seek to identify securities that trade at prices substantially different than their intrinsic value. Our long portfolio consists of securities that we believe offer return potential of at least 50% over 2 years, and for which we understand why the market’s perception of the underlying company should change meaningfully over our time horizon. Jackpotjoy plc (LSE:JPJ.LN) is an example of one such idea. Jackpotjoy (“JPJ”), formerly known as Intertain, is the number one bingo-led, online gaming company in the world. In 2014, Intertain was listed on the TSX and acquired InterCasino from Amaya. Over the next 2 years, the company acquired 3 additional online gaming companies, including U.K. focused Jackpotjoy. In January 2017, Intertain changed its name to Jackpotjoy, redomiciled to the U.K., and relisted its equity on the LSE. JPJ offers a variety of bingo, casino, and social games in the U.K. and other international markets. These games create a network of users and a virtual experience that has generated a loyal customer base. 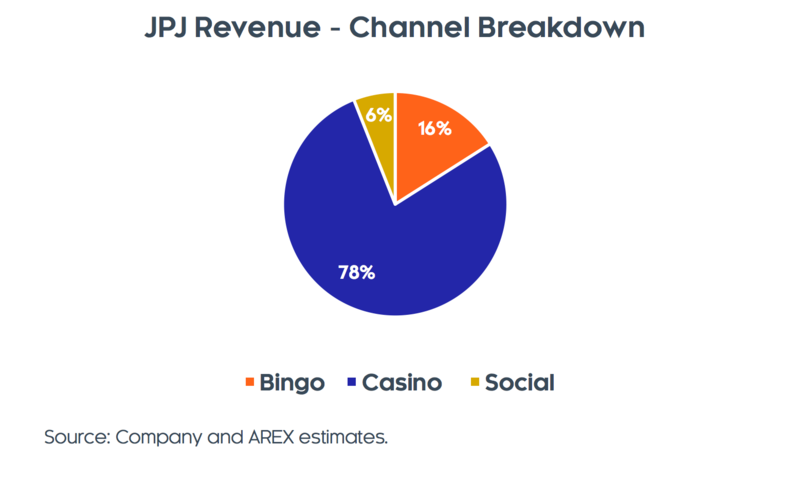 JPJ users are initially attracted to its bingo games, but the majority of its revenue is derived from online casino games (primarily slots) that can be played simultaneously with bingo. Importantly, today, approximately 75% of JPJ’s revenues are generated in regulated markets, and that number will increase to 90% by 2019. Unlike many traditional “value” opportunities, JPJ participates in end markets with attractive underlying growth. JPJ’s core market is the U.K., which represents approximately 65% of revenue. The U.K. is among the most advanced online gaming markets, and online gaming still only has a 34% share of total U.K. gaming revenue. 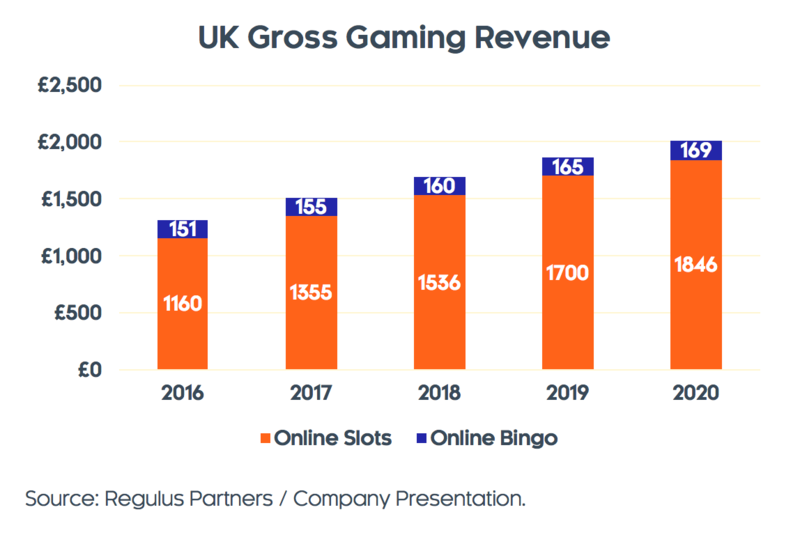 U.K. online gaming grew 10% last year and is expected to continue growing at a 10% CAGR for the next several years. 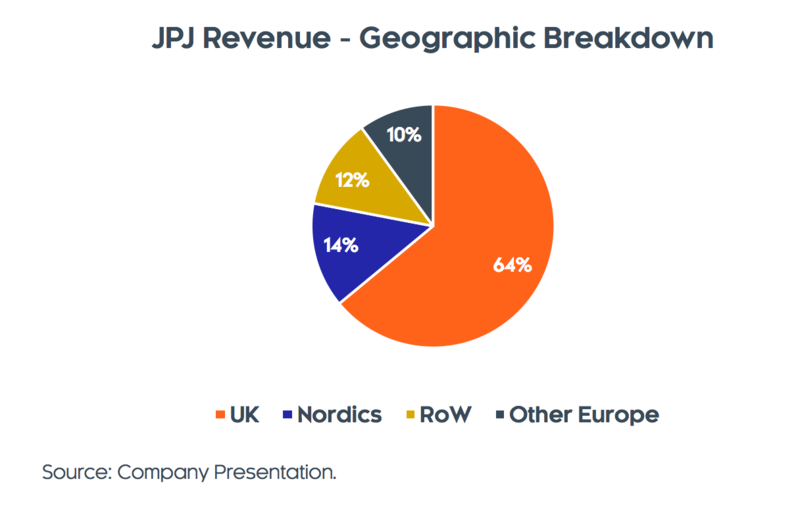 JPJ’s revenues from its other existing markets, including the Nordic (14% of revenue) and Spanish (8% of revenue) markets, are growing, and that growth is expected to continue. In particular, Spain grew 27% in 3Q17, an acceleration from its 21% pace in 1H17. In these markets, like in the U.K., JPJ is expanding its share of growing underlying markets. Globally, there are even more opportunities, and JPJ’s proven brands, scale, and demonstrated operating expertise make it a likely beneficiary. Potential legalization of online gaming in markets like Brazil, and eventually even the U.S., are enormous call options for JPJ to create additional value for shareholders in the future. JPJ is very well positioned in its attractive niche market. 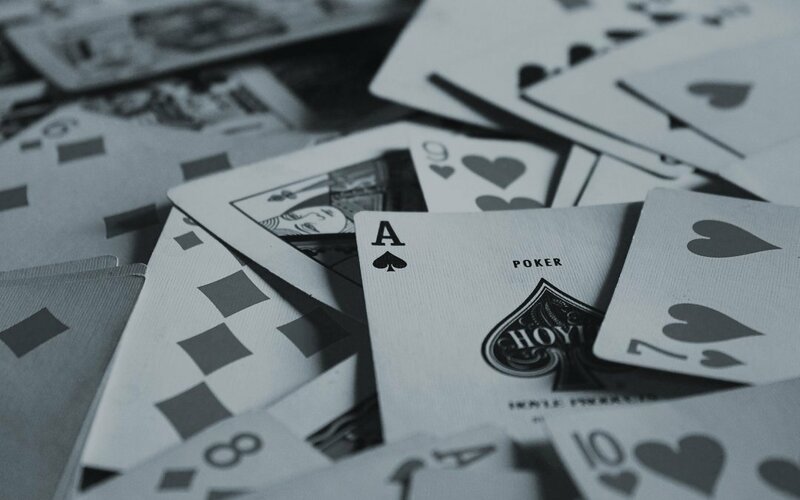 In online bingo, similar to online poker, scale is a competitive advantage and liquidity is crucial. On JPJ’s site, there is a new bingo draw every 6 minutes, which lets users know that they will be able to log on to the site at any time and immediately find a selection of games to choose from. 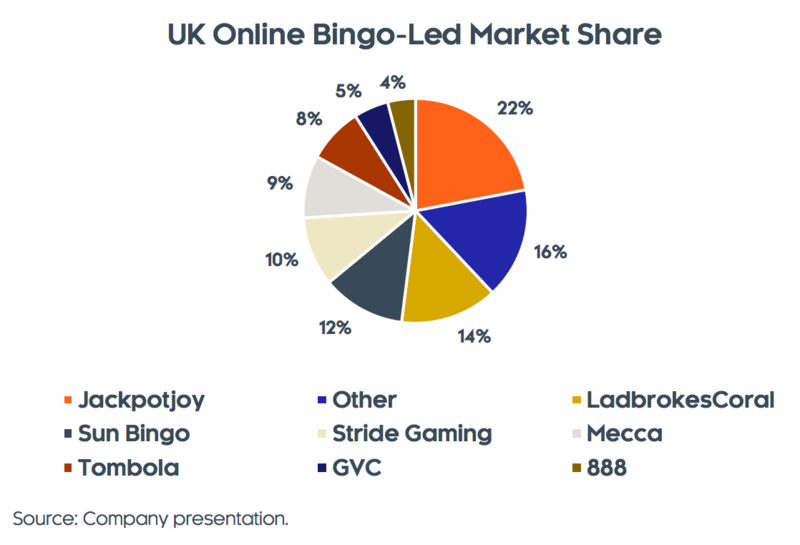 JPJ’s industry leading market share in a still fragmented market ultimately allows for more frequent games, shorter waiting times, and higher jackpots than other sites– which creates a virtuous cycle and high barriers to entry. It also presents JPJ with the opportunity for substantial additional market share gains. All of this has led to an attractive and growing customer base. JPJ has over 250k average monthly users who spend an average of £90/month on the site. Moreover, 90% of 2016 revenue was generated by customers who joined the site in 2015 or earlier. Over time, this sticky customer base allows JPJ to have greater revenue visibility, a higher operating margin, and ultimately a higher ROI. Meanwhile, JPJ generates only 60% of its revenue from its mobile site. While this percentage has grown (it was 55% at the end of 2016), it remains below its peers, which are at 70-80%. 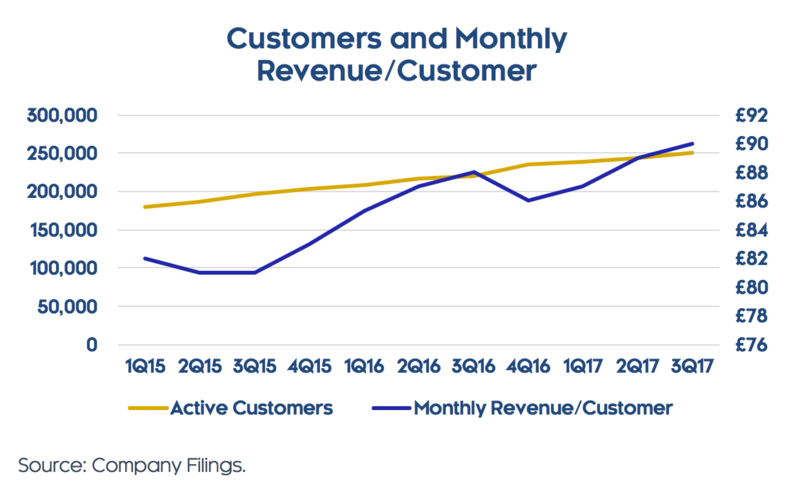 Generally, revenue per customer is 27% greater on mobile than desktop, and this gap relative to competitors creates an incremental opportunity for JPJ to further expand its mobile business and to drive incremental revenue growth from its existing customer base. We frequently see opportunity in companies undergoing transformations, and 2017 represents the culmination of a multi-year transformation for JPJ. The past few years have seen formative acquisitions, a redomiciling, a relisting, and even a change in reporting currency from the Canadian Dollar to the British Pound. And in the critical next step of its evolution, JPJ is finally poised to become a substantial free cash flow generator. A large acquisition-related earnout payment will cause reported 2017 free cash flow to be negative. But the combination of organic growth in revenue (which we believe will exceed 10%) and EBITDA (which converts to free cash flow at a rate above 90% given JPJ’s lack of corporate level taxes and capex), along with the substantial reduction in earnout liability payments, will drive free cash flow from (£26mm) in 2017 to £46mm in 2018. Another year of growth, along with the absence of any earnout payments, will drive growth in 2019 free cash flow to more than £100mm. This free cash flow inflection is coinciding with JPJ’s balance sheet achieving a steady state level of leverage, leading to expanded strategic options. In December, JPJ refinanced its bank debt, cutting interest expense and extending maturities in the process. JPJ’s net debt/EBITDA ratio is currently ~3.1x, which compares to its target level of 2.5x. In 2018, free cash flow generation and EBITDA growth will allow JPJ to reach its leverage target, after which management is likely to return capital to shareholders through either repurchases or dividends, or both. JPJ’s complex history. The formative M&A, redomiciling, and relisting have created both a lack of familiarity with JPJ’s current business and opportunities and significant turnover in its shareholder base. JPJ’s niche market. While JPJ’s niche market positioning creates an attractive economic opportunity and growth outlook, it also results in few comparable companies, limited research coverage, and less investor awareness. Obfuscated financial results. JPJ’s highly attractive free cash flow conversion and incredibly low free cash flow multiple are being masked by temporary factors, most importantly large M&A-related earnout payments. JPJ comfortably satisfies both of our conditions for an exciting long investment. We expect JPJ to generate ~135p of free cash flow per share in 2019, assuming no share repurchases. At current prices, this equates to a multiple of ~6.3x and a free cash flow yield of ~16%, an incredibly inexpensive valuation for a healthy, growing business, and a valuation that we believe affords a real margin of safety against impairment of capital. Given our expectation for JPJ to grow its free cash flow per share at a mid-teens rate annually post 2019, we believe that JPJ can trade at a multiple of at least 12x free cash flow (equating to an 8.3% free cash yield), or a share price of 1620p, approximately 90% above current levels. Notably, this high valuation would still place JPJ below the average of peer valuations. Beyond the outsized return opportunity, JPJ clearly stands to benefit from a change in narrative. The passage of time, demonstration of attractive organic growth in revenue and EBITDA, generation of free cash flow, and initiation of a return of capital will drive increased familiarity with this “new company” and will transform how JPJ is perceived. This should allow investors to fairly value JPJ equity based on its compelling business economics, free cash flow generation, and growth prospects. DISCLAIMER: This content is for educational and/or entertainment purposes only. Opinions, advice, statements, services, offers, or other information or content expressed or made available by third-parties, are those of the respective author(s) or distributor(s) and not of Capitalize for Kids. Neither Capitalize for Kids nor any third-party provider of information guarantees the accuracy, completeness, or usefulness of any content, nor its merchantability or fitness for any particular purpose. In many instances, the information available through Capitalize for Kids represents the opinions and judgments of the respective information provider. Capitalize for Kids neither endorses nor is responsible for the accuracy or reliability of any opinion, advice or statement made in this document or distributed by Capitalize for Kids. Under no circumstances will Capitalize for Kids or the third-party provider be liable for any loss or damage caused by a reader’s reliance on information obtained through this document or distributed by Capitalize for Kids. It is the responsibility of the reader to evaluate the accuracy, completeness or usefulness of any information, opinion, advice or other content available through this document or distributed by Capitalize for Kids. Please seek the advice of professionals, as appropriate, regarding the evaluation of any specific information, opinion, advice or other content. 5 Things You Need to Know to Be a Great ..
BCA – Energy Sector Strategy: Constructive On U.S. Shale Producers ..